This onion top stir fry recipe was created in an effort to reduce wasted food. 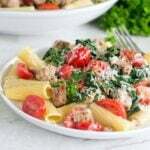 It’s healthy and fresh and an easy, delicious dinner recipe. I once heard a radio interview with a couple who had managed to only fill a single garbage bag in a whole year. They bought goods with very little packaging, they composted and they reduced waste in all its forms. I don’t compost. I don’t even have a garden (read here to find out about my most recent sad sad gardening attempts). So when Herndon Farms sent me a huge box of their Lil’ Bo’s Petite Sweet Vidalia Onions with tops attached, I cringed thinking about what that wasteless couple would say if they saw me fill a garbage bag to the brim in moments, and worse, fill it with something potentially useful. I couldn’t toss all those onion tops. I had to come up with a way to use them up. I discovered that the onion tops could be simmered in water for 5 minutes to yield a full-flavored vegetable broth. I also added whole tops to soups and stews for flavor, fishing them out before serving. 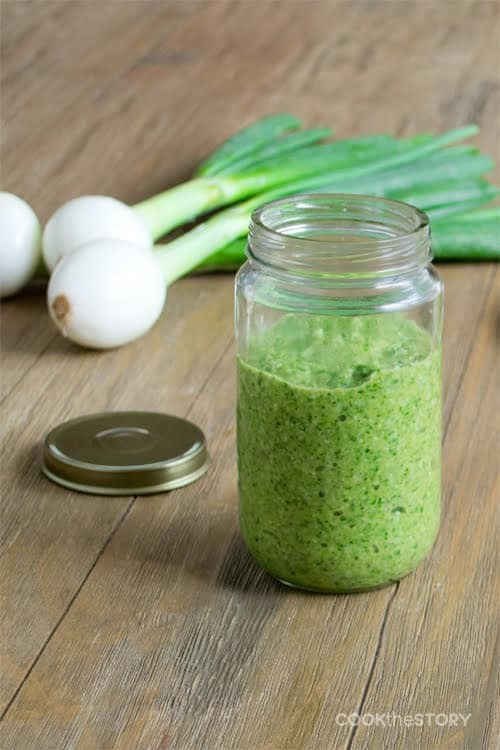 And I found out that if the onion tops were chopped and blanched slightly they could be blended into this delicious onion pesto recipe. Since the quick-blanching made them tender enough to blend, I wondered if another quick-cooking method would make them tender enough to eat whole. I popped them into a hot pan with oil and cooked them for a couple of minutes, until they were bright green with some sides as brown and crispy as the peel on a homemade French fry. Then this onion top stir fry recipe was born. This vegetarian onion top stir fry recipe is a great way to reduce food waste, and it's also a delicious Asian side dish. In a small bowl combine the sesame seeds, soy sauce and honey. Set aside. Cut the green parts of the onion tops in 2 inch pieces. When you get closer to the whites, thinly slice them. Heat the oil in a large skillet over medium-high heat until shimmering. Add the onion tops and cook, stirring continuously, just until some bits are as brown as the peel on a homemade French fry, about 4-5 minutes. Remove the skillet from the heat. Stir in the honey mixture and serve. 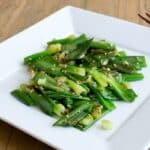 If you don't have your own garden onion tops and can't yet find the baby onions with tops in your store (they should start appearing in the fall), you can use green onions. The resultant stir fry doesn't have as strong a flavor but it's still a delicious and easy side dish. 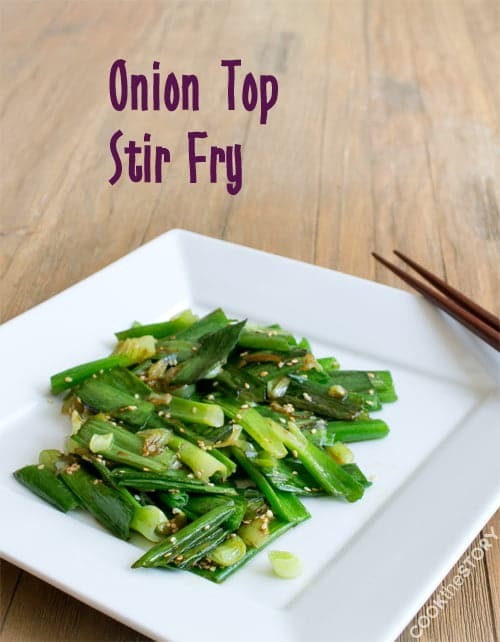 This onion top stir fry recipe is quick and easy and has become my favorite Asian side dish lately. Now tell me, what do you do to reduce waste in your home? Do you have tricks for other kitchen scraps? Scroll down to the comments to let me know about it and to see what ideas others have shared. Disclosure: Herndon Farms paid me to develop two recipes for them and to photograph the recipes. This is not, however, one of the recipes I submitted to them. I was therefore not paid to develop this recipe. 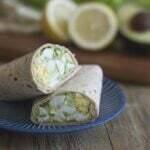 This is a recipe that I created for myself. But I thought you’d want to know that money has exchanged hands between this company and me, and onions. They sent me a big box of onions, some of which I used to come up with this recipe. With regular green onions you can put them while in a cup with water, punch off what you need and they will continue to sprout new greens in the center. I am going to try it with these onions. A never-ending supply of Vidalia greens – yummy! 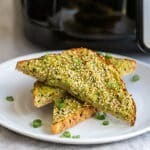 I love the stir-fry and pesto recipes! We use old bread for bread crumbs all the time. This is partly because GF bread costs A LOT, and mainly because it taste better. Wow, I would never think to do this, but they look awesome!! Sues, I wouldn’t have thought of it either if I didn’t have so many of them. I’m so happy I got to experiment with them. The coolest thing was that they make such an easy and quick vegetable broth. The tops from one onion, 1 cup water, boil then simmer 5 minutes and you’re done. It doesn’t taste just like onion but has a lot of flavors. Amazing. I froze a bunch for them and save them for when I need a quick broth. Thanks for visiting! I love what you wrote and how you reduced waste with these onions. I am not very good at reducing waste in my home. The best that I do is try to remember to use the ingredients I buy and eat the leftovers because I am ALWAYS buying too much food! I’m the same way, partly because I’m often recipe-testing. So I can’t just make do with whatever’s in the fridge but require a specific ingredient that has to be bought. But I try when I can. For these onions, it was simply that the tops would have filled two garbage bags and I just couldn’t bring myself to do that.